The first Tokyo Game Show took place between August 22 to August 24, 1996. I went on 8/22 and 8/24. The Tokyo Game Show is crowded! It was HOT. It was a weekday, and there weren't many major guests, but it was crowded. I bet it will be very bad tomorrow and Saturday. Today, I saw Nagashima Yuko (at Ask Kodansha), Tange Sakura, Ishikawa Hideo, and Niiyama Shiho (at main stage), and Melody (at main stage). I missed Ikezawa Haruna (Bandai), Miyamura Yuko (NEC), Kanai Mika, Koorogi Satomi (Jaleco), etc.. The Konami booth was packed. They had LOTS of Tokimemo cels on display. Beautiful cels! They also had lots of Tokimemo goods and modesl on display too. 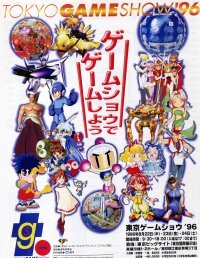 I got a Saint Tail saturn game poster. Some of the seiyuu events that I knew about were as follows. There were probably more..